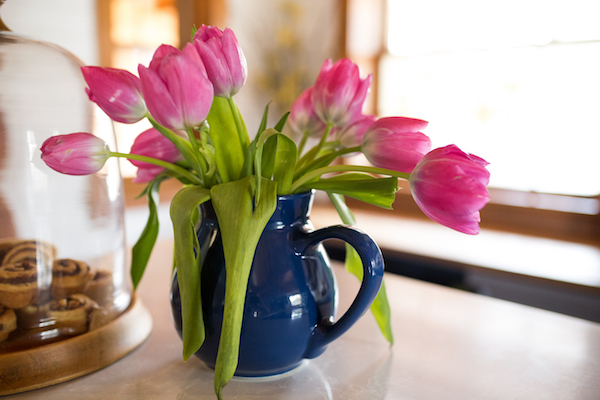 So what do you do if your budget is tight but you’d love to give your home a fresh update for Spring? You may not realize it, but there is a way to revive and refresh all the rooms in your house – without spending a cent. Do you think it’s impossible to redecorate for free? Well, just keep reading and I’ll tell you how. Take a look around the house for all of the accessories and artwork you own – including art work, sculptures, vases, candles, picture frames, even plants. Gather them all up and place them all on your kitchen table, this is now your own little decor shop. Look at everything on your table with new eyes, as if you are seeing it for the first time. Just because that piece of art has always hung over the fireplace does not mean it wouldn’t look even better in the foyer. Or maybe the frame just needs a quick spray paint to be perfect over your bed. Perhaps that red vase that faded into the background in the family room will make your powder room pop. Keep going, item by item and room by room, until you have redone your entire house. This is the perfect job for a weekend so take your time and it’ll definitely be worthwhile in the end. Keep in mind that when it comes to decorating, less really is more. That means you don’t have to find a home for all the pieces. Inevitably, there will be leftovers that just don’t seem to ‘fit’ anywhere – at least for now. If you love some of the unused items, store them until you redecorate again, and if you don’t, then it’s time to say goodbye. You can give find them a new home or donate them, just don’t keep them around taking up your precious space. Now with less items around you’ll definitely spend less time vacuuming and dusting and just think you did it all without spending a cent plus you’ll feel great giving some much appreciated things away for someone else to enjoy.